Evocation of an era can be a tricky ideal to achieve in a gallery space. With the potential for works to repeat themselves and end up stale, trying to define a time and perhaps even a place through curation seems like a monumental balancing act to achieve. The new DLA Piper Series; Innocence and Experience proves this is a positive possibility and the exhibition drips with a swinging sixties chic that is highly addictive. Curated by one of the iconic figureheads of the era, the exhibition not only evokes this time period but also acts as a personal reflection on the curator herself. Marianne Faithfull’s piecing together of works seems honest and natural but at the same time works at a logical level of progression and even as a simple train of thought. Using both works that she likes and work she’s had a personal connection with, walking around the gallery space seems like stepping into Faithfull’s psyche. Robert Mapplethorpe’s photographs are the first work on display to meet the viewer, defining the era already spoken about but also referencing the connection between Faithfull and the artistic movement of the Indica art scene in London established by co-curator John Dunbar. This sort of ideology is held strong through a collection of works where either the artists were Faithfull’s friends or the work itself was actually about her. 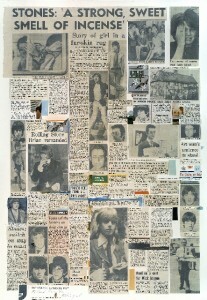 Richard Hamilton’s Swingeing London 67 (1967) collage is said to be the building blocks of the exhibit with the work speaking of the notorious Faithfull/ Rolling Stones story that filled the papers of the times. This work in particular highlights the cross pollination of arts in the 1960s; something which Faithfull is adamant to show to the entire world and perhaps even mourn. More Faithfull themed highlights include an early music video piece by legendary director Derek Jarman (Broken English: Three Songs by Marianne Faithfull 1979) that showcases both of the artist’s talents to the extreme and a forward thinking approach that meant both artists were well ahead of the time they lived in. Looking at the more traditional elements on show, Lucian Freud’s Two Plants (1977-1980) is one of his rare paintings of natural form showing the dying leaves of a plant as it ages. The passing of time is another aspect that fills the exhibition there is a strog sense of nostalgia for a time when, as Faithfull states, “had no boundaries”. The second room in particular looks back in this way and the logical progression of the pieces gives a wonderfully flowing feel to the viewing. The space seems dominated by Man Ray’s small but deeply personal Indestructible Object (1965) which was the first piece actually chosen to be in the exhibition. The lack of rhythm in life is there for all to see with the metronome sadly no longer ticking away as the eye of a loved one watches on. 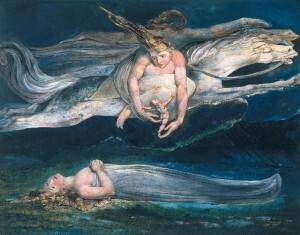 The nostalgia grows ever stronger as some beautiful William Blake paintings (Newton 1805 and Pity 1795) bring back Faithfull’s childhood before it sadly passes, as it must for all, signified by Francis Bacon’s unnerving portrait of Blake’s death mask (Study for Portrait II (After the life mask of William Blake) 1955). The two real highlights of the show are by David Tremlett; an artist rarely given the focus he deserves. The Cards and The Spring Recordings (1972) mix together forming a travelogue of Britain in the early 1970s, a time after the swinging had stopped. The Cards are small pen and ink drawings of the English countryside while The Spring Recordings are the soundtrack of the journey made through each county. With these being made while Liverpool was still Lancashire, the sounds of the Lancashire countryside play over speakers as the viewer admires the cards. The calm and tranquil nature of this work speaks volumes about the journey that Faithfull has undergone throughout her life. The fast, hedonistic and free days of the 1960s are here in the exhibit, presented through a nostalgia as well as through a fondness for Liverpool itself (Faithfull on Jim Lambie’s Ska’s Not Dead; “ It’s witty which is correct for Liverpool”) but also present is the overwhelming time lapse between now and then, presented in a gentle and majestic sense, looking back with a smile but quietly aware of one’s own mortality. from the 21st of April to the 2nd of September. Free Admission. Previous articleLiverpool Art Prize Opens this Week! Next articleWriting on the Wall Festival: Below Decks!